iBall has launched CompBook Exemplaire+ laptop in India. It comes with a 14-inch display with a resolution of 1,366 x 768 pixels powered by a 1.92GHz quad-core processor with 4GB of RAM. It comes with 32GB internal storage which can be further increased up to 128GB by inserting a microSD card. The notebook also gets an optional slot for hard disk drives up to 1TB. Packed with a 10,000mAh battery, which the brand claims can deliver 8.5 hours of regular usage and 19 days of standby time. 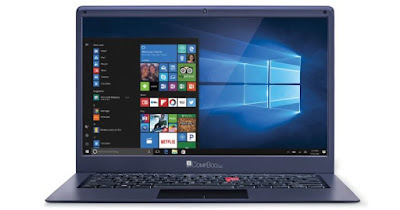 The laptop’s connectivity options include built-in Wi-Fi, Bluetooth, a mini HDMI port and USB ports. There’s also a webcam on board for video calling purposes. It runs on Windows 10. The iBall CompBook Exemplaire+ laptop has been priced at Rs 16,499 and will be available across channels in a single shade of blue.